Attractive damask pattern carry-all tote bag in turquoise and white. 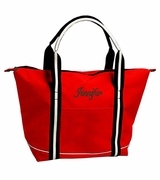 A day travel bag that is fun, vibrant and perfect for vacation, work or errands. 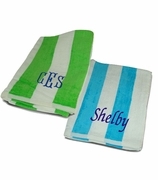 Choose embroidered personalization with name or three letter monogram for a personal gift. 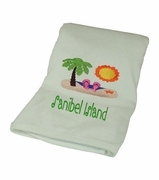 Nice size for a market or shopping tote. The embroidered floral tote bag measures 20"W x 17"H x 7" across bottom with zipper closure. Tote is lined with inside zip wall pocket and small 4" x 6" attached accessory pouch. Comfortable over the shoulder straps, supported footed bottom, front zip pocket. Overall height 23". The company got this bag time so fast. It is made well and so cute. My grand daughter is going to love it to carry her American Girl dolls in with all their clothes.